I'm reading through The Creative Licence, one of my Christmas pressies, and I've started drawing into one of my sketch books. 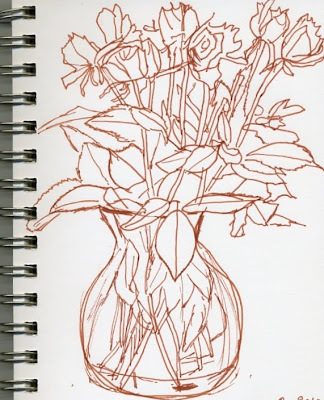 I started that sketch book in 2007, did 2 drawings in 2007, one in 2008 and picked it up again in 2009. I've probably done more drawings in it in the last week than I had over the last 3 years! Hopefully I'll keep it up. Here are my Valentine roses - that's 2 weeks on, so they are on their way out. All the more reason why I wanted to capture their beauty before they're gone! With Laura over last Saturday night, we decided to watch a DVD I hadn't seen in a long long time - Le Grand Bleu. A beautiful story of love and the sea, and choices to be made between the two. It's a Luc Besson film and it stars Rosanna Arquette, Jean Reno and Jean-Marc Barr. Johana Baker, an insurance claims investigator, falls in love at first sight with Jacques Mayol, a free diver who lives on a different planet - he is more comfortable with dolphins than with people. Jacques Mayol and Enzo Molinari compete for the free-diving world title, and the action takes us around the blue Mediterranean sea. Will love conquer the sea? Well, you'll have to find out for yourself. And apparently, different versions have different endings, so make sure to get the long version, the director's cut. It's a slow movie, which is probably why it didn't do well in the US, but I found it completely absorbing. Rosanna Arquette (of Desperately Seeking Susan fame) is very good - funny, fragile, determined, lost. If you've never heard of this movie, get the DVD. You won't regret it. PS - it's a French movie, but it's all in English, so don't tell me you don't watch sub-titled movies. I do like crows. I like the look of them, and I like the fact that they are quite intelligent. At the gym, when I'm on the cross-trainer (twice this week, better than last week - we went only once! ), I can see a murder of crows swooping around the area in front of the cafeteria. People must throw bits of food at them, as they are always hanging around there, along with magpies (which I like too) and seagulls (not so much - I think seagulls are bullies and thugs!). I found this article about how clever they are. Check out the video - impressive! And I've known that a group of crows is called a "murder" of crows since the 3rd or 4th episode of Flash Forward, which we're still watching. I have to admit it's grown on me. Lost it's not, but there is enough mystery in it to keep me watching. The main attraction at the Hugh Lane Gallery is the Francis Bacon Studio - an area of the museum where they have completely reconstructed Bacon's South Kensington Studio, piece by piece, brush by brush, sock by sock! An archeological team was involved in the painstaking mapping, tracking and labelling of every item in the room, including the walls - apparently a total of 7000 pieces. And it wasn't a tidy room, let me tell you (in striking contrast to the rest of his lodging at the same address). You can't really see it that well, as there are only 5 viewing points - one at the door, left ajar, 2 windows and 2 pin-hole magnifiers that show the paint on the wall across the way. But there are a few screens around the area with audio-visual information about the various items found in the room, including 100 slashed canvases! There is an exhibition on Francis Bacon currently running in parallel (until the 7th of March), with photographs, paintings and slashed canvases. I'm not sure where the permanent collection ended and where the temporary exhibition started, but I enjoyed it all. 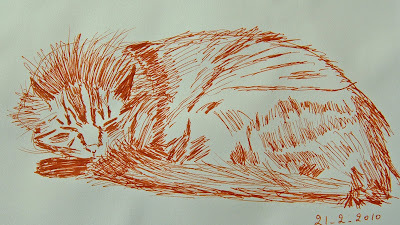 I drew this while Willow was asleep on our bed early Sunday evening. I was trying out my new Faber-Castell PITT artist pen (by the way, I paid in Euro what these pens cost in Dollars on Cheap Joe's website, but I was in Kennedy's art shop, and they were calling out to me "buy me, buy me"). Somehow, I managed to catch his general shape and head before he moved too much (anybody who knows cats knows that, even in their sleep, they never stay in the same position for very long). I added the general shading on his body and tail after that. This is the first time I've managed a life drawing of Willow that actually looks like him, so I'm really pleased with myself! PC Medic is back writing his blog! And he's also on Facebook and Twitter! And did you notice that beautiful mouse mat in the picture with the computer? You can buy one like it on my Zazzle store, www.zazzle.com/_MHBD_. If you're into Buffy the Vampire Slayer (in which case you are probably following the lovevampires.com blog), you will probably enjoy Night Watch. It's a 2004 Russian movie. It's set in Moscow, in a world where "others" live among humans. There are Day Others (who have some super-powers - some are shape shifters, others can see the future, etc.) and Night Others (vampires). The Day Others go on Night Watch to ensure that the Night Others don't break the terms of the truce. I haven't seen the second movie (Day Watch), but I presume that the Night Others go on Day Watch for the same purpose. The truce was reached in Medieval times, after a battle during which the Day and Night Others nearly annihilated each other (a lot of "other" in this sentence! ), and they realised that neither could win. I won't tell you about the plot - I don't want to spoil it. It's very gritty and dark, and it's also got great humour (though not every review I've read seems to agree on that), and references to Buffy! It's described as a mix between The Matrix and The Lord of the Rings. If you want to know more about the plot, check out this review. 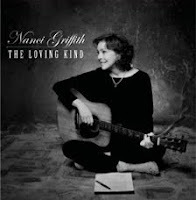 She is still in Ireland, playing in Navan tonight, then on to the Belfast Songwriters' Festival, and to Letterkenny, before she takes the tour to Australia. Quite a world tour. She was in Castleblayney last night, at the Iontas Arts & Community Resource Centre! We were in the Hugh Lane Gallery yesterday - we had Laura over for the weekend and she is interested in art, so we thought it would be good to take her to a museum. It was years since I last was there, and Brendan had never been. It was a perfect opportunity. We saw so much (including the Francis Bacon studio, more about that later) that we spent over 2 hours in there (well over the one hour we had expected to stay - with dire consequences for our pay-and-display situation!). The last room we looked at was the Stained Glass Gallery, situated just at the entrance / exit. 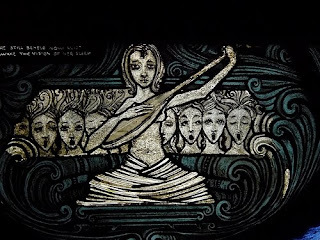 We were mesmerized by Harry Clarke's The Eve of St Agnes, based on Keats' poem (very long poem - I don't think I'll be reading it). Check out this Flickr page for plenty of photographs of Harry Clarke's works. I've copied a couple here from this Flickr group dedicated to the artist, as they seem to be the only location on the web to have decent photos of The Eve of St Agnes. I can't understand that the Hugh Lane doesn't have good high-res pictures on its site. And the shop didn't have good photos either - they had a few notebooks, mugs and pencils, but the photos were far too small to do it justice. To me, that's a missed opportunity, as I would happily have parted with money for a good reproduction of this mesmerizing work of art. Next time I'm in London, I'll be checking out the V&A's Stained Glass Gallery, which apparently has some of his work too. Click on each photo to see them in a slightly larger format. 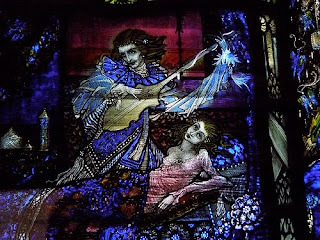 For more Harry Clarke information, check out this website, which appears to be work in progress: www.harryclarke.net. OK, this is the last one in the series. Although I'll have one more picture to take of it, as this photo doesn't include the last stage - the scratching of the waves with a blade. This one is in a big format again (508x406mm). 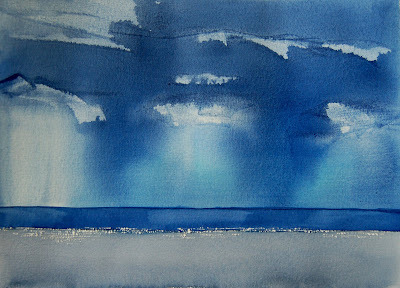 It's a bit wacky, but I like the blending of the blues (that's got a nice ring to it, that, "the blending of the blues"). I have to push myself to paint bigger - it's just practice at the end of the day, knowing how the paint will flow and where it will stop. Much easier on smaller paper. I think my 2 favourites of the series are the last one (13 Feb) and the first one (16 Jan). I also like the acrylics version (17 Jan) - it's somewhat chunky, but the colours are good. We didn't go out on Valentine's Day - restaurants are always too packed, with an impact on service. I just don't find the experience worth the effort. But I did get my roses (we picked them in Lidl together while doing our weekly shop - the 5.99 bunch is absolutely gorgeous. They're short-stemmed, a lovely deep red, nice and tight, and they look beautiful! When I was working in an office, I used to love for Brendan to send me a big bunch of fancy roses (he used to be travelling a lot in those days), as I could show them off around the office after picking them up from reception. But nowadays, I really don't need a fancy bouquet, and I think these roses are going to last longer than the €50 ones I saw in one of the florists. But enough about me - it was Brendan's birthday last week, and we tried a new Indian restaurant. Well, it's not new actually, but it was our first time there: Rasam in Glasthule. It's upstairs from the Eagle House pub. The decor is really nice - cosy, but with plenty of room between tables. We picked our dishes from the Early Bird Menu. Not as much choice, but what we ate was lovely. I had a chicken starter, and Lal Maas for main course, a slow-cooked lamb. Brendan had the pork for starter and the chicken for main course. The dishes were served with pilau rice, naan bread and a potato side dish. All excellent. We might have liked a little more rice, but really there was plenty! Very good value at €19.95 per person, including tea/coffee (which we didn't have). The only thing to watch out for is the price of the beer - Brendan had 2 glasses of beer - they were €5.50 per glass - not that unusual in a restaurant, I guess - but we found it a bit steep, particularly offset against the value of the menu itself! OK, I admit it. I'm completely obsessed with Zazzle. I've spent a good bit of time re-organising my store, adding new designs and products. And there are so many more I want to add! 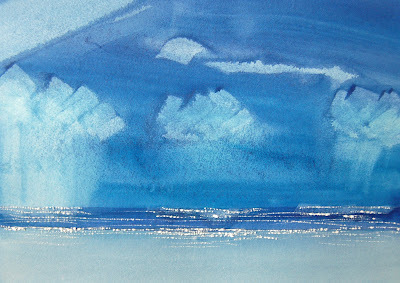 And I want to paint more watercolours that can be used as designs. That didn't stop me from doing a bit of painting today, and the day went very quickly! If you're on my Christmas list, you know about the Aboriginal Snails. Well, I have a special request for you: if you have kept these beautiful and unique Christmas cards, can you take a good digital photograph of it and send it to me? I would like to use these designs in my Zazzle shop, and I really have a good photo for only 1 or 2 of them! I thought I had more, but unfortunately no, most of the photos I have are too fuzzy to enlarge. If you can't find them (or, horror of horrors, you have thrown them away! ), never mind, I'll just have to paint more! 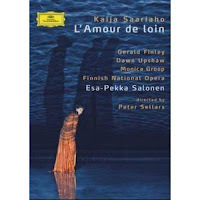 A few weeks back, I watched a DVD of a Finnish opera in French, called "L'amour de loin" (love from afar). Sounds strange, hey? Well, I got into it, and it was actually quite good. A lot to do with the fact that Dawn Upshaw was the principal singer, perhaps. I don't particularly like the way French sounds in opera - for reasons I don't understand, French opera is sung with a heavy, serious, old-fashioned accent. I don't know why a modern opera can't be sung in modern French. But I didn't let this spoil my enjoyment of Kaija Saariaho's opera. Directed by Peter Sellars, it's a feast for the eyes as well as the ears - really bare - initially I thought I would need more eye candy, but as soon as Dawn Upshaw appeared (not literally on stage, but high up on a spiral staircase), I was taken in. I'm not sure how it would sound without the visuals - I must play it some time without watching the DVD. 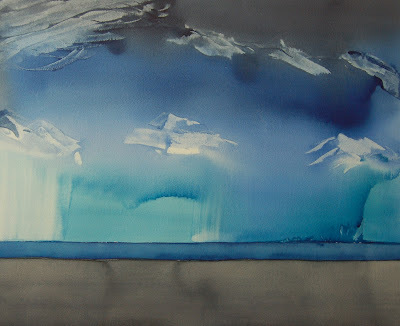 It should really be called "Sky at Killiney" - the sea is not the main element of this painting. I feel I'm getting closer to the effect I want - these 2 paintings were done in relatively small size (9"x12"). The more successful of the two on cold-press 140LB Canson paper. The paper I used for the other one was too light and didn't give me the diffuse effect I was looking for. And the colours are more South Pacific than Killiney! Now the challenge is to achieve the same effect in a larger format - I'll tackle that tomorrow! It's been another busy week. Sorry for not finding the time to update my blog. I did get to paint last Sunday, but I haven't had a chance to photograph the painting in good daylight. But in the meantime, I've been Zazzling - I discovered Zazzle this week, a website where artists can sell their art in many different formats - tee-shirts, mugs, cards, mouse mats, aprons - you name it they have it. The idea is that artists create their own shop within Zazzle and sell their designs without having to worry about production and delivery. Zazzle gives the artist a percentage of the sale (10% for most items), and then sends the money to the artist via Paypal. You need to be computer literate to create and populate your store - but it's no more difficult than writing a blog. So I've created my own, which you will find at www.zazzle.com/_MHBD_ (you will also find me at the International sites). So, go and have a look... and maybe buy something! We were looking at pictures of the San Andrea fault on Google Maps, and we found this area of cultivation not too far from it. I can feel a painting coming! We finished Series 6 of Buffy the Vampire Slayer a few weeks ago. We're taking a little break from it before we start Series 7. I want to make it last. And now, we've started a new box set, one of Brendan's Christmas presents - The Wire. We've only just started (we're planning to watch episode 4 this evening), but I already feel hooked (we have a DVD box with 6 sets - apparently 5 series and a bonus set). It's a cops and druggies story, set in Baltimore. It's not too violent so far, but I'd say it's got the potential to be! Certainly, the thank-you letter from the show's creator/producer/writer is catching my attention for what's coming up! ... you will love Bistro One's new Facebook and Twitter pages. Mouth-watering stuff! After the disappointment of missing the end of Series 3 of Brothers & Sisters because we couldn't get 4oD anymore, I was delighted to see that the start of Series 4 was available when we were able to get back on a few weeks ago. I had to show this picture of Alex Reid - it's so awful! And he was such a nice guy on Big Brother that he won it, basically winning over the public who had booed him when he went in. Very unfortunate he has a taste for fake tan. Another busy week. Not much to report in the world of arts and crafts and good food/movies/books. If, like me, you're an Obama fan, you can be an actual fan of the White House on Facebook. They've just posted a photo album summarising his first year in office. Really good.